It’s heartening to see the good that blooms when people share their gifts. If you were at the 11:00 service on Sunday, you may have seen the beautiful knit scarves, sweet Christmas tree ornaments, yummy baked goods and colorful pins available at the United Methodist Women’s Holiday Fair. Clearly created with love and great talent, these items inspired a shameful level of covetousness in me but also a great appreciation for the skill required to make them. Based on my son’s recommendation, we purchased a felt snowman ornament with a sequined blue scarf. He was made by Renata and Leah Dickerson and I’m looking forward to remembering the Dickersons each Christmas when we hang it on our tree. Less immediately visible than the effort and artistry that went into making these items was the generous spirit of their makers, who donated proceeds to the benefit the UMW World Thank Offering. But Day League is just one way Andy works to support victims of sexual assault. He founded law firm Deitch & Rogers in 1998 for the sole purpose of filing lawsuits against negligent third parties whose actions create conditions that allow criminals to victimize innocent people. In this way the firm seeks to help assault victims recover from feelings of helplessness, giving them hope that these conditions will be changed so that no one else endures the same crime. Glenn congregant Reverend Wesley Stephens has also been applying his gifts to making the world a better place, and was honored for his efforts by LeadingAge Georgia, the Georgia Institute on Aging, at a November 5th gala at the Atlanta History Center. Surrounded by his family, he received a Positive Aging Award. The presenter noted his role as primary care giver to his wife Annette while she was living with dementia and how he continued serving Glenn and the community at Wesley Woods Towers after she became ill.
At Wesley Woods, LeadingAge Georgia notes, “he has been a source of much encouragement to other care partners, often counseling and offering support. He is often a resource for staff members and spends much of his day checking on staff, offering assistance in any way he can.” Around the Towers, he’s regularly brightening days with his jokes and stories, and is known as the go-to guy when anything needs to be fixed, having repaired everything from file cabinets to wheel barrows. In spite of a recent neck fracture, Wesley remains active (he insists on being called “Wesley”), and has accepted with grace the news that he will have to wear a neck brace for the rest of his life. He gave his car to his granddaughter, always makes an effort to get to know and encourage those assisting him with his care, and is adapting to the physical changes he faces every day, including learning how to puree food and becoming an expert at eating various things with a straw. And there’s this anecdote, which puts my minor aches and pains into better perspective: He recently joined his family on a week-long camping trip, neck brace and all. What Kind of Magic Will You Help Create? Each August, the youngest children of the Glenn family experience the excitement, anticipation, and sometimes trepidation that accompanies the first day of school. Eager and nervous parents hold the hands of eager and nervous preschoolers and toddlers as they walk into the building. You can almost see the fears and shyness melt away, however, when the children behold the playground. They step onto that hallowed ground and are instantly drawn to the physical and imaginative play that awaits them. I wonder how the playground has become a part of their vast and creative imaginations over these last couple of months since school started? There is something magical about the playground. From an adult’s point of view, we’re extremely fortunate to have such a large space for children of all ages (yes, teenagers still play on the playground), shaded by the trees and protected from the street. From a child’s point of view, we have castles, a drawbridge, sandy beaches, an Olympic track, horses, and launchpads to outer space. Just listen to the magic our children create on the playground. Then take it a step further - join their trip to the moon or their perilous climb up the mountain. Make some new memories and just have fun. There is something magical about the playground. Some of my favorite memories involve the “old” Glenn playground, before the current structures were put in around 25 years ago. I reveled in being old enough to go up “the big hill,” pretended to drive the train to far off places, and swung on the swings high enough to touch the leaves in the trees. My kids have their own memories of the current playground structures. It was the site of a third generation wedding at Glenn - my then-5-year-old-daughter pretend-married her Glenn Kindergarten classmate there one spring day. It was also where she lost her first tooth. My kids have played hour upon hour on the playground and have relished milestones - learning to pump on the swings, conquering the fire pole, playing soccer with the big kids, running races on the track. Feelings of frustration turn to elation when a new skill is mastered; their proud, beaming smiles broadcasting their joy. There is something magical about the playground. But equipment wears down. Beloved parts of the playground break and need repair more frequently. Updated safety standards teach us ways that we can improve our playgrounds so that our children can continue to experience the joys of play without fear of getting hurt on aging equipment. What a blessing that our playground has had so many children on it for so long! Now it is time to envision and facilitate play with a new playground. As the playground committee is hard at work getting the logistics in place, we can do our part to help create the magic by donating to the Playground Makeover Fund. Your donation will ensure that children will be enjoying our playground for another 25 years and beyond. Will your children or grandchildren be making new memories and creating their own magic for years to come on the new Glenn playground because you helped fund it? There is something magical about the playground. What kind of magic will you help create? Help us meet our fundraising goals to renovate the Glenn Playground! Pledges welcome and of course cash, checks & online donations. Follow us on Facebook or click here for more info. Our blog this week comes from J.R. Atkins, Glenn member and Candler School of Theology student. He spent his summer in Bethlehem and we have been excited to hear more about his experience! During the summer of 2017, I had the privilege to live in Bethlehem, Palestine and work through the Methodist Liaison Office. I am grateful for the funding I received from the Candler Advantage Program and the support that made my experience possible, as well as those of 13 of my fellow students. My work consisted of three main projects but also included several other ongoing assignments, creating a dynamic experience. Methodists have had an official presence in Jerusalem since the late 1800s. We don’t have a church building, as the Lutherans, Catholics, Presbyterians and Orthodox do, but instead we invest our time and funds in a multitude of projects. I was able to visit many of these projects and contribute, as volunteers from all over the world have the opportunity to do. Through the relationship with Tantur Ecumenical Institute, I engaged with interfaith dialog between Christians, Jews and Muslims. One of my favorite assignments was serving as driver and tour host for seven seminary students and faculty from Queens College in Birmingham, England. The days were long and filled with sharing the experience of social injustice in Palestine, and the joy of God’s healing grace. United Methodist preachers serve at St. Andrews Church of Scotland, and over the summer I was invited to preach there. I also worked on the website and social media for the Liaison Office. J.R. preaching at the Christmas Lutheran Church in Bethlehem, Palestine. The Christmas Lutheran Church and the Methodist Liaison Office have been close partners for many years. As a result of this relationship, I was invited to participate in worship, offer pastoral care, and build a new website in English and Arabic with Christmas Lutheran Church. Thy also gave me the opportunity to preach on my last Sunday in Palestine and I received a warm welcome from the congregation. For me, the highlight of this portion of my summer was working side by side with Arabic Christians and gaining an appreciation for their culture. I learned that having coffee is an invitation to be in relationship, not simply a hot cup of java. I found the Arabic culture to be extremely hospitable, the people easy to talk with and eager to engage with. One afternoon, I had lunch with a member of the congregation that lasted three hours. With my American concept of time, I was ready to leave at the midpoint. Yet, it was in the second half of our visit that the man opened up to me and shared what was on his heart and mind. It was one of the most heartfelt conversations I had all summer and we created a friendship that will last a lifetime. The Nassar family has owned their farm since 1916, when their grandfather purchased it from the Ottoman Turks. They possess documents of ownership from each ruling power: the Turks, the British, the Jordanians and are now are struggling to maintain their ownership under Israeli rule. Their land is in Area C, which was created by the Oslo Accords in 1995. The Israeli Military is now in control of all aspects of society. Only through international support has the Nassar family been able to hold on to their land and continue to farm it. They insist on peaceful means of resistance to occupation. At the entrance to the Tent of Nation. The stone says, "We refuse to be enemies’" in Hebrew, English, and Arabic. My role was to create a self-guided walking tour of their family farm that created a connected between the land, with scripture and the visitors. Each of the 10 stations, such as a cave (for living), cistern (for water) and carob tree (for food) related to a Bible verse and was written on the tour guide sheet along with an exercise, aiming to create a personal experience. Each station was marked with a stack of rocks containing a number. Perhaps you or someone you know will visit the Tent of Nations and participate in the self-guided tour. Through my work on the farm, I befriended the Nassar family and international visitors. The Tent of Nations hosts thousands of visitors each year. Some come to work on the harvest of grapes, almonds and olives. Others come to work on the two-week summer camp held for local children. And still others come just to work and connect to the earth in a spiritual way. They live in a cave or tent, drink the cool water from the cistern and eat family style with the other volunteers and Nassar family. This experience provided me some understanding of farm life Palestine and what is like to live under occupation. J.R. with the Mayor of Bethlehem, Anton Salaman. In addition to the three main projects, I met new friends and identified more ways to interact with the people of Palestine. For example, I held a communication workshop with the staff of the Bethlehem Museum of Natural History, provided insight on how to develop markets in the US for the Bethlehem Free Trade Association, delivered a talk about online marketing for Palestinians starting a business at the Bethlehem Business Incubator, consulted on the “Green and Clean Campaign” for the City of Bethlehem, delivered a best practices workshop with the communications department at Bethlehem Bible College, served as an unofficial “ambassador,” encouraging visitors to the Walled Off Hotel. My work supporting and encouraging the people of Palestine continues today through Skype, email and social media. My goals before, during and after my summer are to (1) pray for peace in Israel and Palestine (2) help the people of Palestine through listening, visiting, developing business skills and by going there and (3) encourage others to visit the Holy Land and meet the people of Palestine. Since my initial trip to Israel and Palestine in 2011, I have actively encouraging others to go to the Holy Land and meet fellow Christians. Stacey and I have made 4 trips so far and have 2 planned for 2018. If you are interested in visiting Israel and Palestine, the tour in May 2018 will be following the footsteps of Jesus and attending the Christ at the Checkpoint Conference. Then in June, I plan to guide a group of business professionals on a Bethlehem Business Exploration trip, touring holy sites as well as meeting with local business owners. Please contact me if I can answer any questions, or share a presentation on my summer experience with your class, group, or association. 1. A more complete display of pictures can be seen at SlideShare.net. 2. The 2 trips mentioned above are not indorsed by Glenn Memorial UMC. Our writer this week is Bruce Cauthen, son of one of our older adults Melvin Cauthen. Bruce is a part of our book study and discussion group this fall on Waking Up White and Finding Myself in the Story of Race. I was delighted to learn from the August issue of Glenn Notes of the upcoming study group, co-chaired by Carol Allums and Pastor Alice, examining Debby Irving’s book, Waking Up White and Finding Myself in the Story of Race. I knew that I had to be a part of what promised to be – and, which, has certainly proven to be - a very worthwhile exchange. My eagerness to participate stemmed from the fact that I have been totally immersed in an extensive research project which analyzes the social construction of race in colonial South Carolina. The study is historical, biographical, socio-cultural, and…at its heart…genealogical. Indeed! Three years ago I made the most remarkable discovery that I am descended from a woman of color who occupied a unique – and seemingly incongruous - niche in 18th century society. Mary Ann Pendarvis Rumph (c.1732-1794), my 6th great grandmother, was the biracial daughter of an aristocratic Charleston planter, Joseph Pendarvis (1699-1735), and his enslaved African mistress, Parthena (c.1702-1734). Joseph never married and left his considerable fortune to Mary Ann and her six siblings whom he had with Parthena. (And, to make a long, complex, and, utterly astounding story short): due to their large inheritance, Mary Ann and her five surviving brothers were able to transition into relatively high-status white society; and, they were socio-legally identified as white. Her elder brother, James Pendarvis (c.1723-1796), would become, perhaps, the wealthiest person of color in British North America. A concurrence of political, economic and social interests actively promoted their inclusion into the colonial establishment. And, as the Pendarvises became increasingly entrenched into affluent white society, powerful forces converged to conceal their African ancestry. Suffice it to say that the conspiracy to camouflage the racial past of my Pendarvis forebears has, sadly, been one of the more effective cover-ups in American history. And, it was due, in no small way, to the unsavory “success” of this cover-up, that I only disentangled my own descent from the Pendarvises three years ago. And, this exciting discovery has prompted a nearly compulsive sense of mission to unearth all I can about the captivating saga of the children of Joseph Pendarvis and Parthena. It has been an exhilarating, fascinating, and – considering the fact that so many of the elements of the subject have been obscured by time, anachronistic perspectives, and instrumental revision – an infinitely challenging undertaking. I initially intended to draft a brief research note (in advance of an anticipated monograph)…however, the preliminary overview (which I recently completed as a synopsis for prospective publishers) is already in excess of 70, 000 words and I have only scratched the surface. 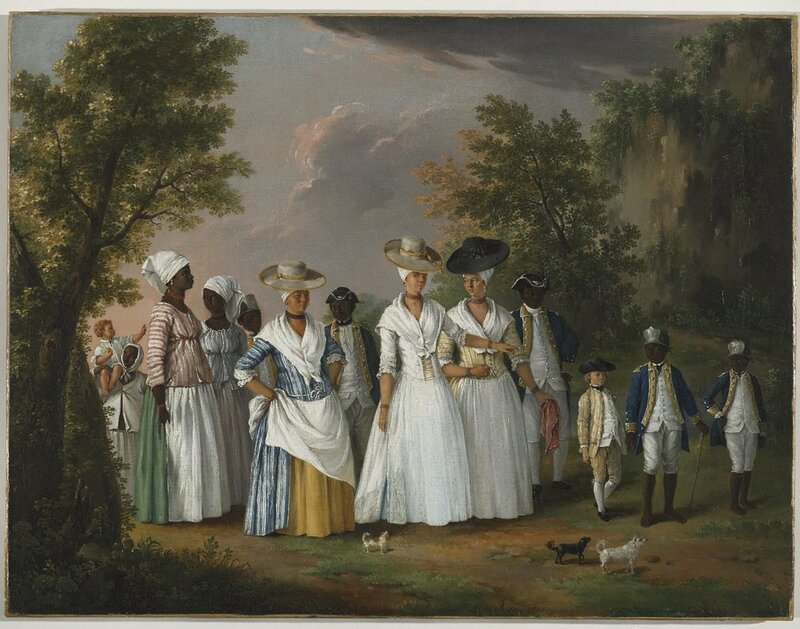 Agostino Brunias, “Free Women of Color with Their Children and Servants in a Landscape”, ca. 1770-1794, Brooklyn Museum of Art, Gift of Mrs. Carll H. de Silver, in memory of her husband, by exchange gift of George S. Hellman, by exchange. Digital photo courtesy of Brooklyn Museum. Yet as intriguing as the historical and sociological aspects of the Pendarvis narrative are from an academic perspective, I have found the personal dimension of the realization equally compelling. For a (then) 51 year old white man, born and raised in South Carolina - whose interest in genealogy has always been most acute, but, who had never detected even the most remote cue as to question that he was the product of anything other than European ancestry - the revelation, admittedly, came as something of a shock. Yet, any surprise I may have initially experienced was very quickly… within about ten minutes… eclipsed by an intense sense of pride to be descended from such extraordinary antecedents. However, this exuberant reaction was inevitably augmented by an ongoing process of introspection. The recognition that I descend from enslaved African ancestors has prompted me to critically reassess so many of my own preconceptions regarding the divisive deliberations about “race” which roil America today… the issues of white and black, privilege and vulnerability, and complacency and disparity. Although the trajectory of the Pendarvis siblings was exceptional and hardly representative of the contemporary norm, it cannot be dismissed as an anomaly. Parthena’s progeny penetrated a racial borderline – ostensibly formidable in theory, and yet, evidently porous in practice. The social construction of “whiteness” in colonial South Carolina was selective and not always exclusively determined by skin color; wealth was a decisive factor as well. At least in this particular instance, the very concept of race appeared to be situational. And even though there are aspects of the Pendarvis “pathway” which are distinctive, if not patently unprecedented, the biracial heirs were not the only persons of color who underwent similar processes of amalgamation into the white community during various periods of American history. In any event, the Pendarvis experience inevitably attests that history did not always unfold in the manner in which we envision it today. Our past is complicated; riven with contradictions; and is, undoubtedly, more accurately understood when viewed through a kaleidoscopic lens rather than a Manichean filter. And, it is in this context that I think we can all learn a valuable lesson from the Pendarvis saga: regardless of how militantly defined, exclusively drawn, and immovably fixed the battle-lines in the rancorous debate over race may seem, the actual boundary between white and black in the United States cannot be so easily established. Ours is a shared heritage which must supersede color, class, and conflict; and, we have only to look back into our collective experience to reflect upon certain nuances and particular dynamics which might have foretold a different outcome than the one we presently confront. Although the historical record on race relations has been admittedly bleak, we need not be held hostage to the fatalism of prior centuries. No, we must rediscover an older and more authentic past in which, far from being sequestered on opposite sides of an unbridgeable chasm, white and black in America were far more intimately and inextricably entwined than we could possibly imagine today. It is this basic reality which we must contemplate, cultivate and articulate to remedy our present and shape our future. My most remarkable discovery has exerted a truly transformative influence – intellectually, morally, and, spiritually – on my being. Although my African ancestry is admittedly distant, the impact of this awareness is palpable and profound. It is a constant counsel which admonishes me that the most indispensable of all virtues is empathy; and, it reminds me that kinship transcends the familiar and encompasses humanity itself. Moreover, it reveals to me that we interact against the backdrop of an intricate tapestry – meticulously woven of various and diverse threads – and, as we are also part of this splendid textile, it is only when we step back and afford ourselves a broader vantage that we can fully appreciate the aesthetic unity of its design and the vibrancy of its myriad hues. And, my most remarkable discovery also inspires me to vigorously look for the hidden springs of edification, empowerment, and redemption which lie buried beneath the surface of our routine. Indeed, how tragically incomplete my life would have been had I not excavated this enlightening font of consciousness three years ago. Memory is often a blessed gift. This lovely incident revived one from my boyhood—when I was in sixth grade, now that I think of it—about the age of our angel-kissed youth. I was leaving our house for school one morning—the school was nearby, so I walked—when I realized that my mother was not home. She worked, but was always there when my brothers, sister and I left for school. This morning, I was alone. Where my siblings were is lost to my memory, perhaps they had walked on ahead. I must have realized that she had driven off for an errand, for I paced back and forth in the carport, waiting for her return. Fearing I would be late for school, I left a time or two, walking a few yards away, but, each time, returning, refusing to submit to circumstance, for, you see, I had not kissed my mother goodbye. Though not occurring to me before, it suddenly dawned on me that this would be the first time I had left without having done so. Amid my consternation in this drama, I recognized that going late to school in order to kiss one’s mother would not be considered a manly act, and I was embarrassed at the thought of having to explain myself. Thankfully, she finally pulled into the carport and I ran up and kissed her. Then she committed a cardinal parental offense: “why are you still here”?….and then, realizing why, joyfully exclaimed, “You waited to kiss me goodbye!” And my filial offense, “No, I didn’t!” and I ran off to school. A boy needs his mother’s kiss. I am grateful for the touching scene I observed outside Wes’s choir room, for it resurrected these memories of affection and innocence. Perhaps it’s a small window into the profound love among mother and child, and a foretaste of the child’s journey alone into the vast of God. How did you first learn of Glenn? Which of our worship services is home to you and why? You are one of many Glenn congregants with Emory ties. Do you think the relationship Glenn shares with the university is an asset to our community of faith? Absolutely! Many students come to Emory for the Methodist affiliation....I came all the way from Jamaica! So I understand the need for comfort or something from home. I also think our fundamental philosophies in the Christian faith casts a wide net that many students find accepting...quite a few continue at Glenn long after graduation. I think that's a testament to the impact Glenn has on the wider Emory community...and vice versa. The constant flow of Emory throughout the years has established a bond and a familiarity with Glenn that facilitates acts of service and comfort in times of need. Emory recently awarded you one of the spots in their inaugural Top 40 Under 40 list of outstanding alumni. Congratulations! Tell us about your degrees and vocational accomplishments. In the work you’ve done, what are you most proud of? Thank you for the kind sentiments! I'm actually an Emory triple eagle. I graduated from Oxford College with an associates degree, Emory College with my bachelors of science in human biology & anthropology with a minor in dance and movement studies, and from Rollins School of Public Health with a Masters in Global Epidemiology. From there I went to University of Miami's (Go 'Canes) Miller School of Medicine for a research doctorate in clinical epidemiology. After finishing my studies (read 8 years and few student loans later), I entered into CDC's Epidemic Intelligence Service (EIS) for a two year post-doctoral fellowship. Thereafter I served as a county director in Guyana (South America) for one of CDC's overseas offices and returned at the end of my two year tour to assume my current position as the Associate Director for our West Africa region's programs. For my current post, I had to learn French - a language I've neither studied nor practiced. Needless to say I am now quite familiar with the intricacies of adult learning (yikes)! I try to stay away from pride lest it precede my fall, but if I have to choose, I'm most proud of being a service member. 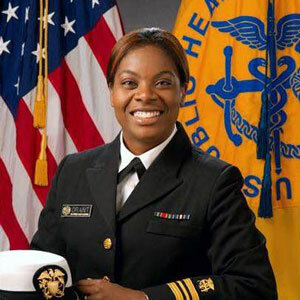 It is an honor to serve as a Commissioned Corps Officer in the US Public Health Service (USPHS). The Corps has a strong history of service from its founding in 1798 with a mission of quarantine and disease control. Now we serve in all agencies within the Department of Health and Human services as well as Homeland Security, Immigration and Customs Enforcement and the Department of Defense. We respond to natural disasters and public health threats all over the world - think Ebola! I'm humbled to count myself among these tireless, fearless souls who aren't afraid to jump into the unknown. Career-wise, or in your personal life, what are you looking forward to? What’s next? Well, I would say in the long term future I would love to serve overseas again. I deeply enjoy travel, cultural immersion and exchange. But for now, I'd like to focus on my family - being present with them, building memories and hopefully adding a member or two (God-willing; Winston and I are accepting prayers in that department!). And hopefully, we'll get to continue growing and serving our Glenn family. Thank you, Yoran, for sharing your story! Running has been a theme in many areas of my life the past couple of weeks. My kids have started their cross country season, so our schedule is filled with practices, meets, and lots of conversation about running and running techniques. Then this past Sunday evening we started a new series at The Gathering on Jonah, a prophet who begins his story by running as fast and as far away from God as he can. In contrast to Jonah, this got me thinking about all the ways that our church “runs” towards God in our ministries and actions. Last Saturday, our church community ran towards God by serving our neighbors on Good Neighbor Day. The people of Glenn spread out all over Atlanta to share love in many different ways. One group went to the Center for Hard to Recycle Materials (CHaRM) and learned how to care for God’s creation better and helped that organization do the good work of recycling items that many of us wouldn’t even know were able to be recycled. Two other groups went to sing and play games with some of the seniors in our community. Some of our youngest Glenn members had the chance to sing “We Are The Church” with some of our oldest Glenn members as a wonderful reminder that we are all the people of God. Since most of us don’t have the capability to run to Texas and Florida to help with the hurricane recoveries, we also had a group of people get together to pack Flood Buckets for the United Methodist Committee on Relief to take as they do the work of cleaning up in the aftermath of Harvey and Irma. This was not the original plan for Good Neighbor Day, but Glenn people saw a need and restructured to make sure we could meet it. In a short amount of time they were able to collect items to fill 57 complete buckets. Add this to the money collected during the communion offering on September 3 and Glenn really stepped up in response to these hurricanes (you can still donate at umcor.org). Add to these those that served refugees, worked at food pantries, sorted medical supplies, cleaned up creeks, and held a field day for our friends from Action Ministries and you get a picture of the heart and soul of Glenn, a people who are committed to running into our community to serve where God is calling us. Thanks to all who participated in Good Neighbor Day and to this church for its continued work in sharing the love of Christ with all who need it. My Summer Reading - Where's the Beef? I was already familiar with Forks Over Knives, a cookbook and documentary about the benefits of plant-based eating and Michael Pollan’s Omnivore’s Dilemna. A member of the Lydia Circle who was present that night later dropped by my house with one of her books, 4Leaf Guide to Vibrant Health, about food choices in today’s world. Then I attended a lecture about a new book called Drawdown - The Most Comprehensive Plan Ever Proposed to Reverse Global Warming. And so rather than the usual summer “beach” reads, I spent my summer reading about food choices. What you might ask does this have to do with Glenn? The Bible asks us to protect the earth beginning in Genesis 2:15 with the call to care for the garden and ending with a passage in Revelation 11:18 that references the destroyers of the earth. As I read through Drawdown, which is divided into sections on Energy, Food, Women and Girls, Buildings and Cities, Land Use, Transport, and Materials, I was trying to figure out what I, as one person, could do to help in this climate change reduction effort. Most of what we read in the national news about global warming is not anything that one person can really make a difference in and so I was drawn to the chapters on food. Everyone eats and that seemed a good place for me to start to get a handle on this comprehensive book that is full of solutions that one by one can help us solve the global problem. Did you know that animals such as cattle are the most prolific offenders of generating methane, the greenhouse gas? Also, the energy consumption to grow livestock feed produces carbon dioxide, and manure and fertilizers emit nitrous oxide. “If cattle were their own nation, they would be the world’s third-largest emitter of greenhouse gases” according to the book. Wow! And so, for health and environmental reasons, we have basically stopped eating beef. My husband Dave and I had been on this journey before I read the book, but the environmental benefits really hit home with me this summer and I have recommitted to not eating beef. Another solution that is discussed in Drawdown is one that most of us can participate in - composting. At our house and at Glenn we already compost our organic food waste and recycle almost everything, but I did not realize how important this was to helping with the climate change effort. When organic waste ends up in landfills, it produces methane gas. Even though some landfills capture methane, it is more effective to divert this waste and compost it for the garden. These are just two of the solutions presented in Drawdown. I challenge each of us and the church as a whole to embrace as many of these solutions as we can. Visit the Ventures in Faith Sunday school class on September 17 and 24 for more discussion on the issue and/or visit the Drawdown website. Look for more information and challenges in a new segment called “Green Notes” that will appear in various Glenn communications throughout the year. So as we broke out the craft supplies as the sun was rising, I was humbly reminded that even in times of natural (or human-made!) disasters, we do not have to be hopeless or helpless - or even "only" offer our thoughts and prayers. As people of faith - both heart and action - we can reach out to our brothers and sisters in need. I invite you to join me in making a donation UMCOR - United Methodist Committee On Relief. If you'd rather give through Glenn Church, just mark your donation for "UMCOR Hurricane Harvey - Advance #901670. If you are like my little one and want a more tangible response, we are also collecting donations for Relief Kits (cleaning kits, hygiene kits, and school kits) to be shared through UMCOR's Disaster Response teams. 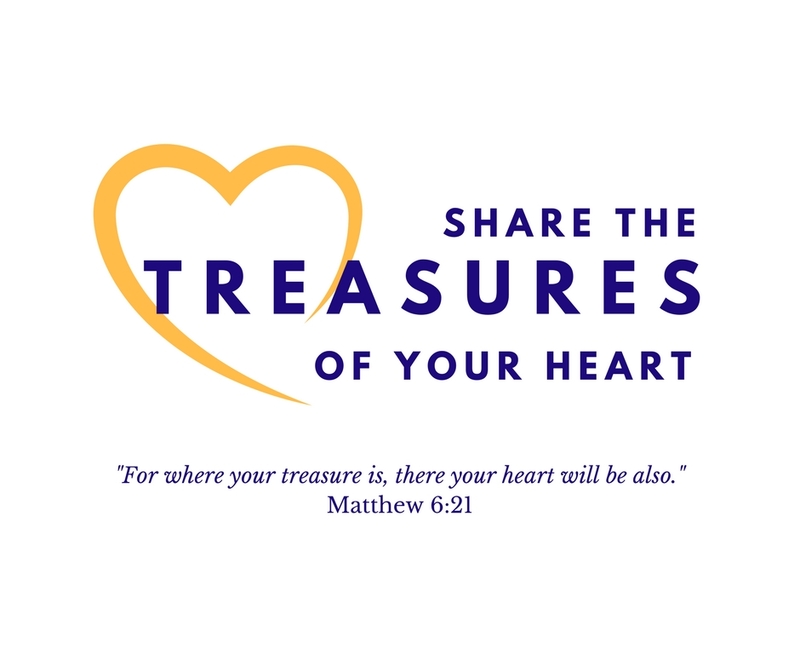 Details are found here and donations can be dropped off by the collection bins near the Little Chapel in the Church School Building between now and Good Neighbor Day on Saturday, September 9. Speaking of Good Neighbor Day, another simple way for children of all ages and adults to reach out to our brothers and sisters near and far is to sign up now to be a part of this special day - sign up for a project now! As August winds down, the school year is ramping up. The youngest children of the Glenn family will be experiencing the excitement, anticipation, and sometimes trepidation that accompanies the first day as Glenn School begins this week. Eager and nervous parents hold the hands of eager and nervous preschoolers and toddlers as they walk into the building. For many, this is their first encounter of the beloved place we call Glenn. We have a lot of ways that our church serves the community, and one of the biggest and most important of these is through the ministry of The Glenn School for Young Children. While there are many wonderful programs that the church offers for family and children - and I am a big supporter of each of them - Glenn School holds a special place in my heart. As a child, I was nurtured by loving teachers like Mudie Weber as my family was going through a difficult transition. Her constant love and extra attention offered me stability that eased my anxieties - I think she literally rocked with me in the rocking chair every day until I no longer needed it. Glenn School and Glenn Church offered our family a home when we no longer felt welcome at the previous church and preschool where we had been. I have many good memories of preschool and Kindergarten at Glenn and I still have my journals filled with drawings as I began to explore expressing my thoughts and ideas. As a teenager, I again encountered Glenn School as my mom returned to teach in the Kindergarten. I loved helping in her classroom, which was much more fun than my high school classes. As a new parent, I couldn’t wait for my daughter to start at Glenn School. Her first experience was in the baby room with Glenn Church member and baby whisperer Nancy Asbury. Her years at Glenn School provided a wonderful foundation she will continue to build upon all her life. Her Kindergarten year at Glenn School was the icing on the cake and truly launched her as person who loves to learn. There was no question that my son would also attend Glenn School, and he is excited to start PreK this week, his fourth year at Glenn School. The talented and caring teachers and staff have supported our family in more ways than I can count, in ways they may never know, and we are forever grateful for their impact on our family. Bethany's son, Adam, feeling brave on the big yellow bug. Jeff, Bethany's husband, and their daughter Madison learning and building together. My story is unique and it is universal. The specifics belong to my family, but the experiences are shared by so many, both church members and members of the community. One thing that I often hear is how at home parents feel at Glenn, both in the school and the church. They know their children are loved and nurtured, encouraged to grow and play and learn. The parents also find a community to share their joys and their fears, their challenges and their triumphs. Words of encouragement or helpful suggestions from other parents going through similar situations can counter discouraging and frustrating feelings. We often only see celebrations shared publicly, contributing to feelings of isolation when things are not going well. A supportive network of parents is crucial to navigate the difficult waters of parenting. One important aspect of Glenn School is that it is open to families and children of all shapes, sizes, and faiths. Families are embraced, period. There are Christian families, Jewish families, Muslim families, families from different countries and backgrounds, and all are welcome at Glenn. Recently, Glenn School and Glenn Church worked together to provide a place for the child of a refugee family new to the area. What better way to love our neighbor? Glenn School has served to open the door to new families getting connected at Glenn Church. Families who might never have made their way to Glenn Church, have found a home at Glenn School first and felt welcomed as a part of the church also. I could go on and on about Glenn School, but I want to share one last thing that is so special about Glenn. At Glenn School, play is paramount. Structured and unstructured, children spend their days playing - and learning about life and themselves in the process. They learn how to fill their time with their imagination, settle disagreements between friends, and simply practice everyday skills they need in life. Teachers create and facilitate situations that allow children to learn to be kind, make good choices, and respect others - things we could all use reminders of in these polarizing and contentious times. Academic learning comes through play - and the skills and concepts learned are better retained because they are gained through creativity and experience. Children leave Glenn School prepared for whatever learning situation they will experience next - and they had fun in the process. The playground is an excellent facilitator of that imaginative and physically-challenging play - for children at both Glenn School and Glenn Church. As we look to the exciting new plans for our playground, we hope that everyone in the Glenn Church and Glenn School community will support the effort to bring that dream to life through donations to the playground fund. The new playground will serve not only the children of today, but hopefully their children as well. Our Glenn Church mission statement proclaims that we are “committed to loving God and loving neighbor….” Whether being loved in the nursery, experiencing thought-provoking lessons in Sunday School, raising their voices in song in choir, relaxing with friends each day in After School, playing basketball, skating, participating in service projects, or learning each day at Glenn School, children are active participants in that mission, both as givers and receivers. Glenn School is only one of the ways in which Glenn Church shares the love of God with the community, but it is a powerful one in terms of the impact on the lives of the families who walk through our doors, year after year. I know our family has felt God’s loving presence through the ministry of the Glenn School, both when I was a child as well as now when I am a parent. I hope and pray that this amazing ministry can impact the lives of families in our community for countless years to come. When I first started attending Glenn, I began by checking out the Sunday School classes. While you can definitely learn a lot about a church by attending its worship services, in my mind, Sunday School offers a unique view into what a church truly values and thinks. After graduating from the Candler School of Theology, I struggled to find a community where I could continue the deep theological studies and debates I had experienced while at Emory. So I was ecstatic when my husband and I attended Glenn’s New Class, led by the Runyons, and found it teeming with sharp Glenn members that included former ministers, professors, and world-renowned guest speakers – all willing to listen, learn, and share. I had found the smart, thoughtful, and gracious theological discussions I had always desired to find in a Sunday School class, and I was hooked. It was as if part two of my theological studies education had picked back up, and it was available to me every Sunday. I realized fairly quickly that one of the things that makes Glenn Memorial so special is that it highly values education of all types. Fast forward a few years, and I now have the opportunity to help organize the Glenn Next Community Sunday School class, bringing in Glenn members, interns, ministers, and Emory professors to continue those enriching discussions. We’ve taken a close look at Genesis, the Psalms, Romans, Methodism, the psychology of religious leaders, and disability in the Christian tradition, just to name a few topics over the years. 20th century theologian Karl Barth called for us all to be theologians, saying, “In the Church of Jesus Christ there can and should be no non-theologians.” Barth also calls on the church to continuously grapple with church doctrine. I’m grateful that Glenn’s Sunday School classes allow for both. Glenn’s Adult Sunday School classes resume September 10 – visit this page for the full list. Glenn’s 2017 Summer Lecture Series wraps up on August 27. Dena (second from left) and her Sunday School class (from a few years ago) being led by professor Joel LeMon. Our summer lecture series has brought thought-provoking reflections from Candler School of Theology professors on some of the well-worn and familiar hymns of our faith, including "How Great Thou Art" and "Be Thou My Vision." This Sunday, about two-thirds of the way through our series, we'll have a Hymn Sing in worship. Our pastors will also have the chance to weigh in and give reflections on some of their favorite songs of our faith. For example, Rev. Susan is planning to share some thoughts on "Blessed Assurance" as she has found that hymn to be a soothing salve at funerals, for the words bring comfort of God's presence with us. Rev. Blair will reflect on the theme of grace in "Come, Thou Fount of Every Blessing", a hymn you've heard at countless weddings, but ever taken the time to apply to your own life? And "I Love to Tell the Story" has been one of Rev. Alice's most beloved hymns throughout her ministry, and was sung immediately following her very first sermon at Glenn back in 2013. Take a few minutes to sit with the words and themes found in the hymns below as we prepare to sing in worship together this Sunday. And no matter your level of singing ability, come and make "a joyful noise to the Lord!" look on thy hands, and read it there! I never will unloose my hold. and tell me if thy name is Love! 'Tis Love! 'tis Love! Thou diedst for me! I hear thy whisper in my heart! as nothing else could do. Sunday - “Rush it, or don't?" The trip started on the buses, and since I wasn’t on the bus with the rest of the boys, I was able to sleep on the way there. Mostly I listened to music though, so we didn't really talk until close to the end of the ride. We talked about random things and what made us excited about the week to come. When we got there, we unpacked our bags and headed to the chapel, where we found fog machines, strobe lights and not a single Acoustic instrument. In my opinion, it wasn't the best way to praise God and this will sound very millennial, but everything was so over-hyped. I’m not saying this way of praising God was bad, but I'm pretty sure fog machines and strobe lights weren't what He was thinking. Hey, I could be wrong. Whatever floats your boat. Then came the preacher, who was a comedian of sorts. He went through a lot of different Tarzan and Fruit analogies, but his main theme was "Taking Baby Steps." After the message, he asked the audience to come up and pray, so some of the group decided to go up, including me, Mathew Jackson, Graham, and Bo. Then they took us into a side room and gave us different pamphlets and calendars and books, and told us they'd call us every Friday for a year. Now this confused me, because just a minute ago, we were talking about baby steps, and this seemed like a big step for me. So that left me wondering how they really wanted us to live out our Christian faith as I climbed into my bunk bed at night. Monday was chalked full of stuff to do. It was our first day of work, and our first day at the beach (I'll get to that later). We spent our work hours at the Boys and Girls Club. I was with Connor (one of the interns), Kevin, Chapman, and Bo, and we went and played games with 10 year olds. First we played a game of Pulse, a team game. Then we rotated to other groups, and played in the game room, the gym, and outside. Afterwards we went to the Shark Beach (I don’t know the real name so we’ll call it that for now). The weather wasn't really beach worthy, but that didn't stop anyone. We ran down to the beach and kept running until we finally got to the sandbar, where we hung out for a little bit until we got back into the water later. The most memorable part of our time at the beach that day was when we found a shark. Well, it was a dead baby shark, but we still took about a hundred pictures with it before we went back into the water to play some games of Mr. President. We then headed to Dairy Queen, where Campbell got her first Dairy Queen ice cream ever, and then went back to our base at Epworth. We met at our own smaller chapel where we sang songs (this time with acoustic guitars) and then talked about our day and how it related to God. We talked a lot about the kids, and their innocence. We went around telling stories about how one kid would be mad at another kid, and then the next moment they would be best friends. This, we all decided, was why we should all strive to be more like children. As S.E. Hinton wrote in The Outsiders, "Nature's first green is gold, Her hardest hue to hold. Her early leaf's a flower; But only so an hour. Then leaf subsides to leaf. So Eden sank to grief, So dawn goes down to day, nothing gold can stay." The next day, we went to help out a veteran in need. He was in Operation Desert Storm and lost a leg during his time there. This affected him and his ability to clean his house, which was not in good shape. We did what good we could, which included mowing his lawn, chipping off old paint, clearing out all of the trash that he couldn't pick up, and demolishing his kitchen to be rebuilt by another youth group later in the week. All of these things were things he couldn't do, but the smile on his face and the help we were giving him lifted our spirits. Later that day we went to a different beach, which, since I also forget the name of that beach, we'll call Jellyfish Beach. It was a nice beach, and everyone was having a good time. Remember how there was a shark at Shark Beach though? Well, if there was a Shark at Shark Beach, there must have been a Jellyfish at Jellyfish Beach, right? Well it wouldn’t have been named Jellyfish Beach if I hadn’t gotten stung by a Jellyfish. Henry was the first to react, and he carried me to the shore. Jad scraped out the stingers, and Kevin even gave me Benadrill to help me sleep. Afterwards we went to Chic-fil-a, and then later we met at the same little chapel where we sang some more and then split up into groups. My group included Connor, Chapman, Kevin and Mathew Jackson, and Graham. We talked a lot about how we had the ability to do things that others couldn’t, and we each shared about what we did to help the veteran. I think that we should all use our abilities God has given us to help those in need. “Therefore, I urge you, brothers and sisters, in view of God’s mercy, to offer your bodies as a living sacrifice, holy and pleasing to God—this is your true and proper worship. Do not conform to the pattern of this world, but be transformed by the renewing of your mind. Then you will be able to test and approve what God’s will is—his good, pleasing and perfect will.” - Romans 12. These were the Bible verses we read every day that week. Mostly though, we talked about what it meant to be a living sacrifice. It is, after all, an odd choice of words, as most sacrifices tend to not be living. That day, we worked at the Safe Harbor Children’s Shelter for runaway kids. It wasn’t backbreaking work, but it was long and painstaking and full of painting. If I had a penny for every time I had to rush to the bathroom to clean off some paint, I’d... have at least a quarter. Maybe 50 cents. But that’s besides the point. Lunch was probably my favorite part, where we all sat around the kitchen table and shouted the lyrics to old songs, and I noticed the surprised look on one of the Safe Harbor Supervisor’s face when he saw us having such a good time doing all of the volunteer work. However, there was one part of our time that caught mine and a couple of other people's attention: we barely saw the kids. After we had worked at the Children’s Shelter for the day, we hung out around our cabins or played games until we went to the chapel. We talked about what it meant to be a living sacrifice, and came to the conclusion that being a living sacrifice was being in complete service to God, and going out to do God’s will, whether it meant spreading the Christian faith, or to help those in need. Kristin, another one of our interns, explained why we saw so little of the kids. First, they weren’t really little kids like we expected them to be; they were our age, and listening to us talk about things they didn’t have could affect them in a negative way. This reminded us that we had so much to be thankful for. We all went to sleep tired that night after a long night of bowling, (or watching Spiderman Homecoming if you are Eli, Nate, or Bo) and the almost midnight pit stop at McDonald's. The next day was the last day we did mission work. It was also probably the most underwhelming work days of them all because all we did was clean up a park. This consisted of scraping paint off of and painting the benches, which wasn’t the easiest thing to do. The reason I called the work underwhelming was because we weren't really making a direct impact on anyone. On Monday, we hung out with the kids at the Boys and Girls Club, which directly impacted the kids because they got a better day out of it. On Tuesday, we directly helped a war veteran in need by working on his house and cleaning it up, and on Wednesday, we cleaned up the Safe Harbor children’s shelter and that directly helped the children by giving them a better place to live. So what was the big deal with cleaning the park, and why did it feel like there was no direction in our work? Later in the day we went to a new beach, and that day the beach was a stereotypical summer beach: cloudless sky, semi-mild water, and lots of people. Surprisingly enough, it was a very normal trip to the beach compared to the other two trips. We had a lot of fun at the beach, and after we went back to Epworth and hung out for a while until our time had come to watch the sunset. We went out by the pier and sang songs as the sun dipped below the horizon. We ended our singing with prayer, and headed off with our little groups to discuss the day. Jad talked to us about how our work on the benches impacted people, and his main point was the people you don’t see, the ones who sleep on the benches we painted because they don’t have a place of their own. This gave us a whole new perspective of what we did that day. As Eli put it, “This was one of those jobs where a job well done isn’t noticed.” Sometimes the little things do matter. So, after a long game of capture the flag that Augie and I could have won for our team if Reid Mallard hadn’t pulled the plug, we went to bed that night, our time at Epworth drawing to a close. We woke up early on Friday to watch the sunrise, which was kind of symbolic for our lesson of the day, which was mostly about how we would carry our experience with us. In this perspective, the trip wasn’t really over. In fact, it really is just a new beginning isn’t it? But it still was sad to watch my home for the week get smaller and smaller in the distance. On the way back we played a lot of games and did riddles, but I knew I would miss these guys for a while, even those who I would see in the following weeks, because the mission trip brought the group together in ways other things couldn’t.